This special issue of Anthurium: A Caribbean Studies Journal seeks papers and reflections on the work of Paule Marshall, situating the author and her writings within the canons of Caribbean, American, African-American, and/or Women’s literature. In particular, we are interested in contributions that consider how, and why, Marshall’s work remains vibrant today, near sixty years after her first publication. Born in Brooklyn of Barbadian parentage, Marshall has made major contributions to each of these canons via seven works of fiction, a memoir, and several essays on writing and culture. 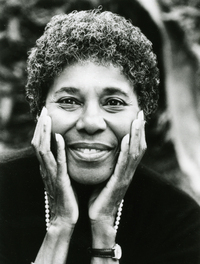 From her first novel, Brown Girl, Brownstones (1959), through her recently published memoir, Triangular Road (2009), Marshall’s writings have poetically evoked the Afro-Caribbean experience in the region and in the Caribbean diaspora. Given the broad spectrum of her oeuvre, her work regularly appears on syllabi across various disciplines in the humanities, attesting to the contemporary significance of her work. Despite this reach and relevance, or perhaps in some ways because of it, scholarship on Marshall remains limited to individual voices in monographs and scattered articles, obscuring the ongoing impact of her contribution to literature and the humanities more broadly. Therefore, this special issue aims to present a rich and diverse examination of how Marshall’s writings continue to speak to today’s personal, national, and global anxieties surrounding, amongst others, questions of race, nation, family, gender, and sexuality. We are open to scholarly papers, reflections, and creative work covering any of these questions, as well as others not stated above. We are especially interested in submissions that consider Marshall’s less studied texts and/or her work in building the next generation of African & African Diaspora literary community while on faculty at New York University. Prospective contributors should email 300-500 word abstracts by 1 April 2016. Final versions of accepted papers will be due 1 August 2016. All completed manuscripts must be submitted for peer review via the Anthurium electronic submissions system. Please send abstracts and all inquiries to Kelly Baker Josephs (kjosephs@york.cuny.edu). About the special issue editor: Kelly Baker Josephs is Associate Professor of English at York College/CUNY. She specializes in World Anglophone Literature with an emphasis on Caribbean Literature. Her book, Disturbers of the Peace: Representations of Insanity in Anglophone Caribbean Literature (University of Virginia Press, 2013), considers the ubiquity of madmen and madwomen in Caribbean literature between 1959 and 1980. She is the editor of sx salon: a small axe literary platform and manages The Caribbean Commons website. About the Journal: Anthurium, a peer reviewed Caribbean Studies Journal founded in 2003, publishes original works and critical studies of Caribbean literature, theater, film, art, and culture by writers and scholars worldwide exclusively in electronic form. This entry was posted in CFPs on February 1, 2016 by Kelly Baker Josephs.